Gujrat city is the capital of district Gujrat of Punjab. This land is famous for many unique and especial items that are hardly present in any other district of Pakistan. The most honorable thing for this district is its brave soldiers that gave three Nishan-e-Haider to this district. Another important thing is its electrical items like fans electrical motors etc. Among the most famous things is the shrine of shahdaula. 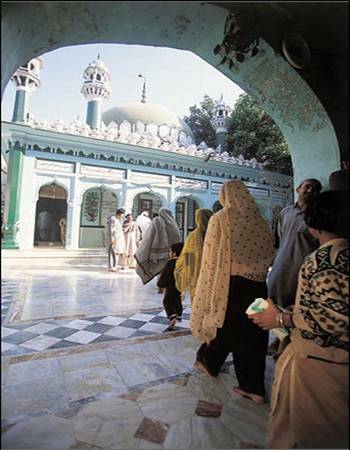 It is the shrine of great saint Hazrat Syed Kabeeruddin Shahdaula who also known as Drayai Gunj Baksh. He was born in 1581 in the half of 16th century. Lodhi Abdur Rahim was his father and mother was Niamat bibi. Soon after his birth his father died and at the age of nine his mother also expired. Then he came in Sialkot, spending some year of life there and went back to Gujarat and settle there during the regime of Shah Jehan Mughal king. That time Gujarat was considered very small town but after the settlement of shah doula it become the most populated city. He was a pious and very religious person. He spends most of time in worship so his prayers were fulfilled by the Grace of Allah Almighty. When people used to know about this pious person, they came to visit him and asked him to pray for their problem, these prayers were fulfilled and people start believing that he is a noble man. Hence, after every coming day, his followers were increasing. Mostly unfertile women used to visit him and asked him to pray for their baby. After the death of Shah Daula still visit his graveyard or shah Daula durbar and pray for their wishes. Shah Daula was very famous for his social work. He is credited with various buildings, bridges, mosques, wells, teachings and charitable work not only in Gujarat but also in other cities of Pakistan. Shah Daula was also said to have great cared for wild creations. Under the Green dome of a 17th century tomb, Kabiruddin Shah Daula’s grave draws many visitors hoping for miracles. Mostly women who are seeking cure for infertility come there and hoped to get a baby due to prayers of his saint. It is also said that they have to leave their first child in Shah Daula Darbar if they do not leave their first child so laterchildren will all be rats or rat kids (Daulay Shah kay Chohay). These rats visit all over the Pakistan. Usually shah doulas are those peoples who have no growth of mind. There are lots of children with small heads. They are called the Rat Children of Shah Daula. People come daily in shah doula darbar but at Thursday and Fridaythere is big gathering of peoples. There are many strange stories relating to shah daula. Now a day’s rat child of shah daula are used to beg money from the people.